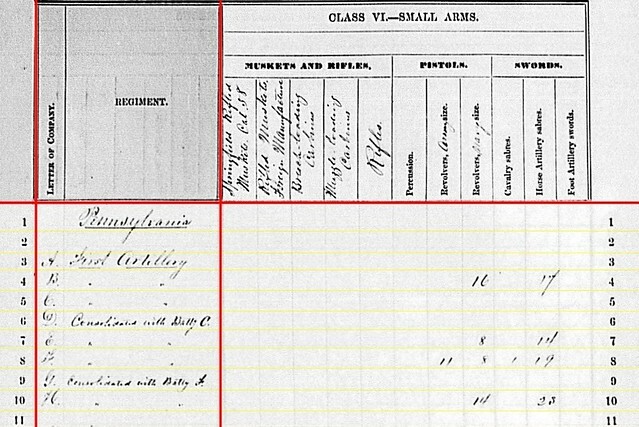 The 1st Pennsylvania Light Artillery (also known as the 43rd Pennsylvania Volunteers) was, perhaps, short-changed with its organization. 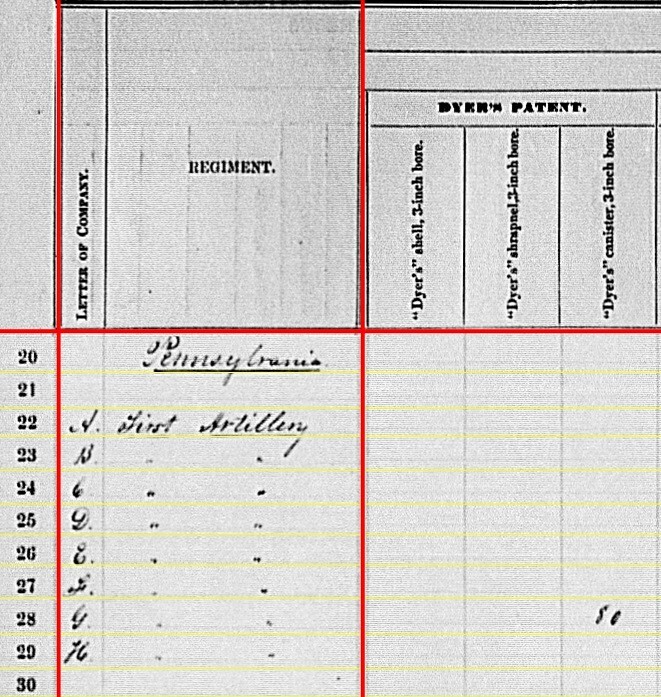 Instead of a full compliment of batteries, the 1st Pennsylvania only ever had Batteries A through I. And even with that, Battery I was only organized in the war’s last months. 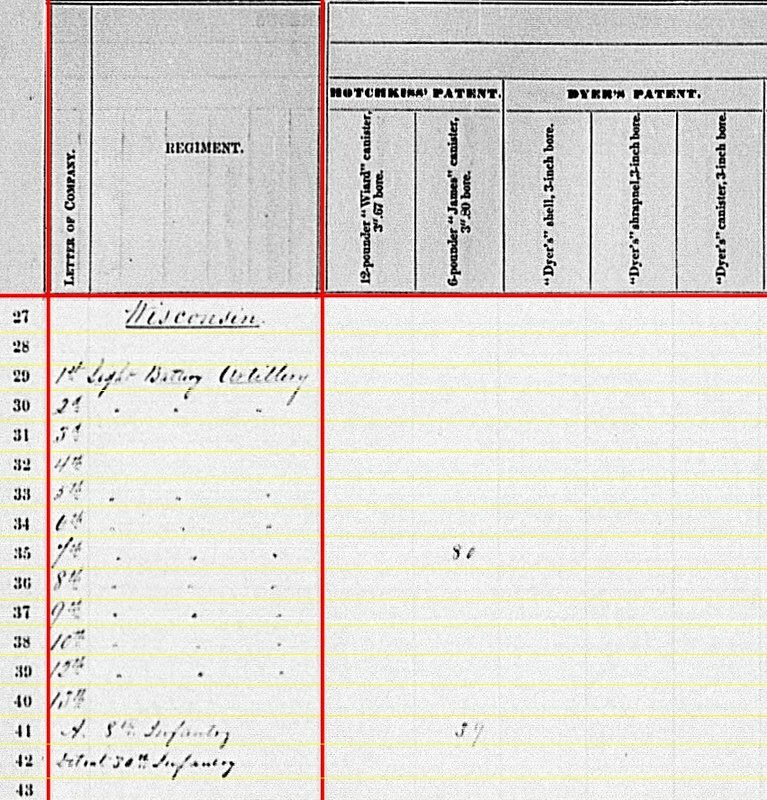 Thus for the second quarter of 1863, we have only eight batteries to account for. 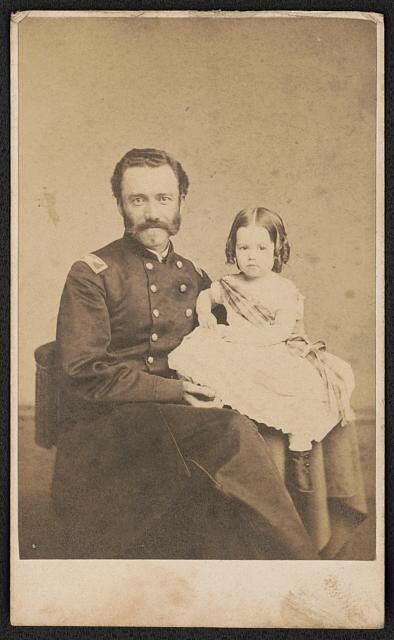 In June 1863, Colonel Robert M. West led the regiment, on the rolls. Battery A: No return. Captain John G. Simpson’s battery was assigned to Second Division, Seventh Corps, then in the Norfolk area. I believe the battery retained four 12-pdr Napoleons. The battery participated in the Siege of Suffolk and Dix’s Peninsula Campaign. 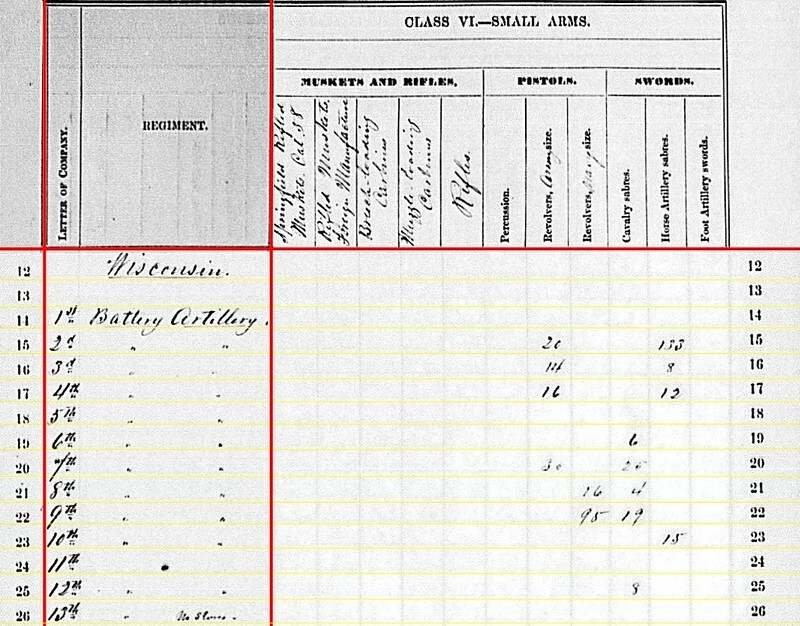 Battery B: Showing as at Rappahannock Station, Virginia, as of August 16, 1863, with four 3-inch Ordnance Rifles. 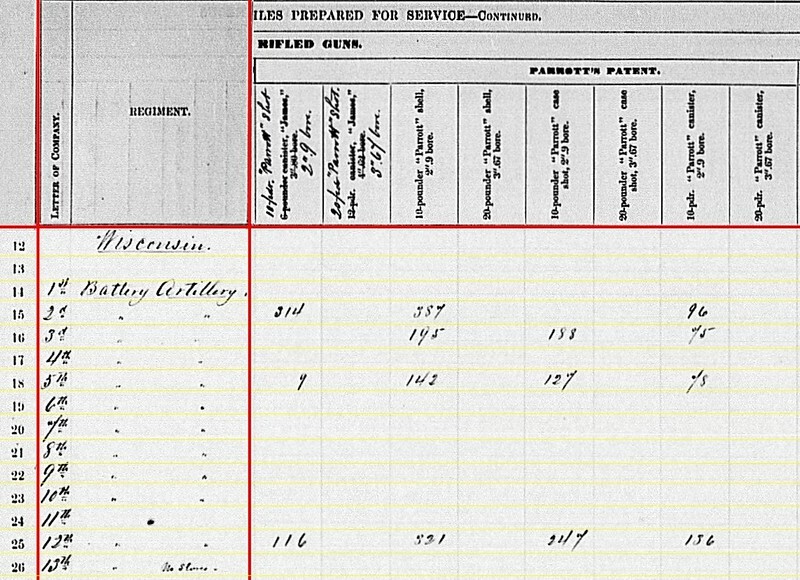 But with an assignment to First Corps, we know well Captain James H. Cooper’s battery was, as of June 30, moving up toward Gettysburg. 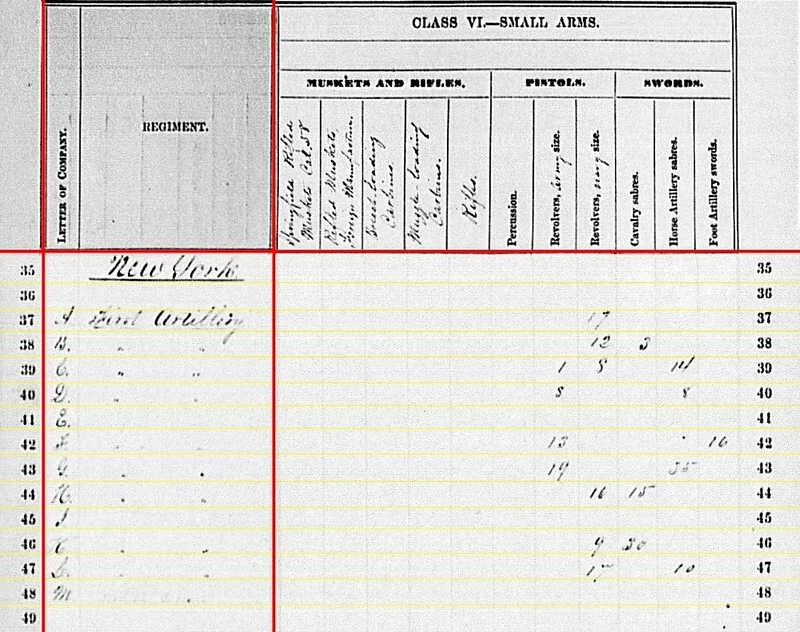 Battery C: Claiming to be at Culpeper, Virginia… well in October, 1863… with six 3-inch Ordnance Rifles (as opposed to 10-pdr Parrotts from the last quarter). Captain Jeremiah McCarthy remained in command. On June 25, the battery was sent out of the Army of the Potomac to Camp Barry, D.C. However, by the end of the Gettysburg Campaign, the battery was back in the field at Harpers Ferry. Battery D: No return. Battery D was consolidated with Battery C through August. Thus we list Battery D as at Camp Barry. Lieutenant Andrew Rosney was the ranking officer of the battery. Battery E: At Yorktown, Virginia with four 12-pdr Napoleons. Captain Thomas G. Orwig commanded this battery, assigned to First Division, Fourth Corps. Battery F: Indicated at Falmouth, Virginia, with a March 1864 reporting date, with six 3-inch Ordnance Rifles. Captain R. Bruce Ricketts commanded a combined Batteries F and G, in 3rd Volunteer Brigade, Artillery Reserve. Thus their proper location, for June 30, was somewhere on the march up from Frederick, Maryland. Battery G: Dittos indicating Battery G was with Battery F for the reporting period. Lieutenant Belden Spence was the ranking officer remaining with the battery. Battery H: At Camp Barry, D.C. with four 12-pdr Napoleons. Captain Andrew Fagan commanded this battery, which in the Artillery Reserve, Fourth Corps. Thus the battery was actually around Yorktown at reporting time. The battery would transfer to Camp Barry in the fall. And as mentioned above, Battery I would not muster until very late in the war. 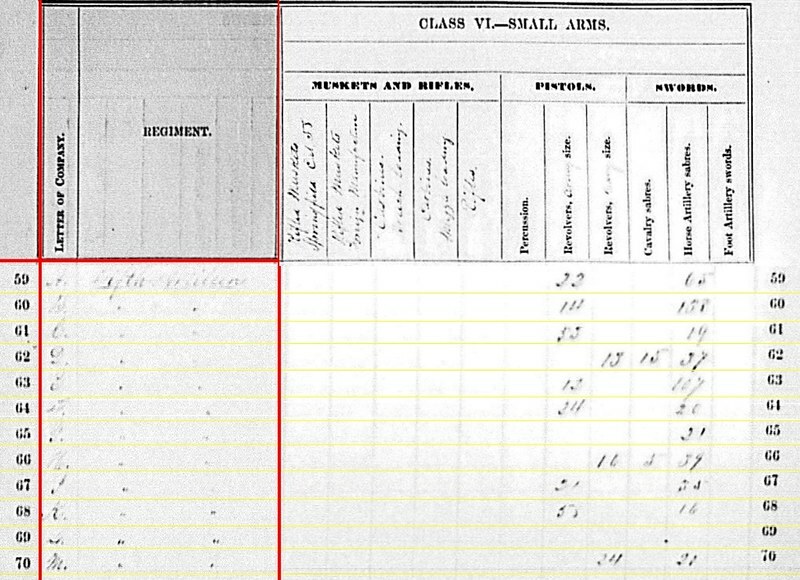 Batteries K, L, and M never existed, save for a notional line allocated on the clerk’s form. Battery B: 20 canister, 180 fuse shell, and 338 bullet shell for 3-inch rifles. Battery C: 180 canister, 104 percussion shell, and 344(?) bullet shell for 3-inch rifles. Battery F & G: 120 canister, 120 fuse shell, and 840 bullet shell for 3-inch rifles. Yes, a lot of case… er… bullet… in those chests. Battery B: 277 shell for 3-inch rifles. Battery C: 158 shell for 3-inch rifles. Battery F & G: 120 shell for 3-inch rifles. Battery B: Sixteen Navy revolvers and fourteen horse artillery sabers. Battery C: Seventeen Navy revolvers and five (?) cavalry sabers. Battery F & G: Sixteen Army revolvers, eight Navy revolvers, one cavalry saber, and nineteen horse artillery sabers. 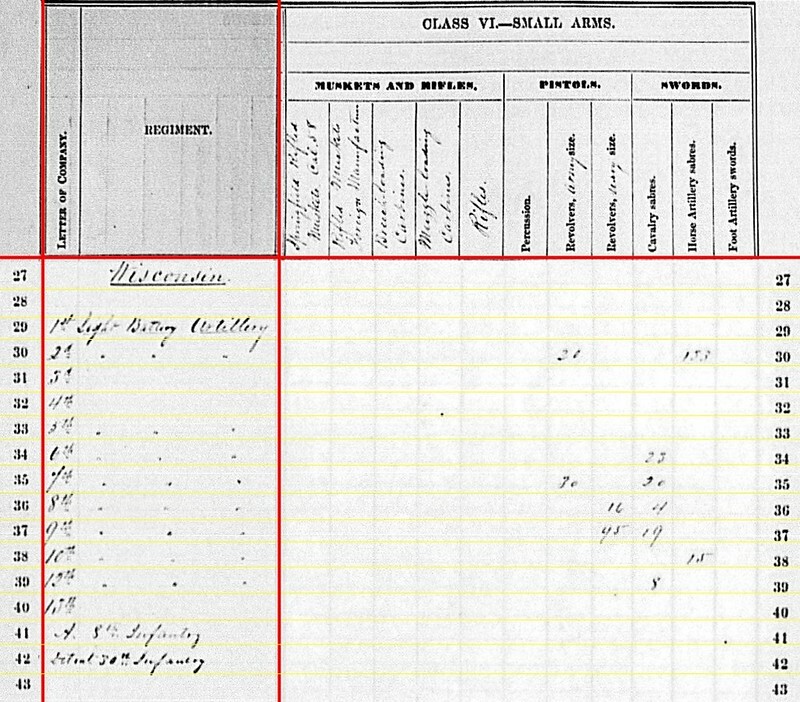 Thus rounds out the 1st Pennsylvania Light Artillery’s report for the second quarter, 1863. Moving in order through the second quarter summaries, New York is the next state to consider. 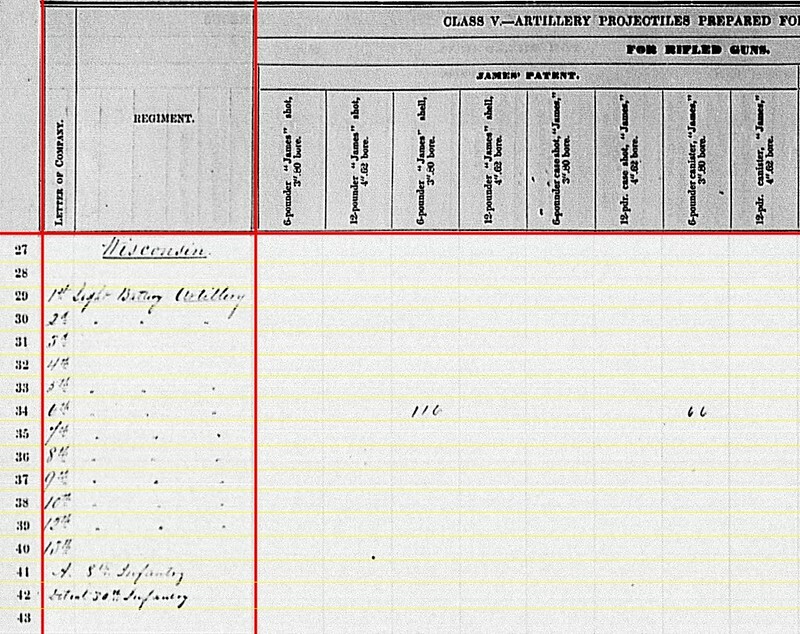 And Colonel Charles S. Wainwright’s 1st New York Light Artillery Regiment is the first of those entries. We find returns registered for nine of the twelve batteries of the regiment. And of those nine, three were not received until 1864. That’s what happens to paperwork due in the middle of the campaign season! 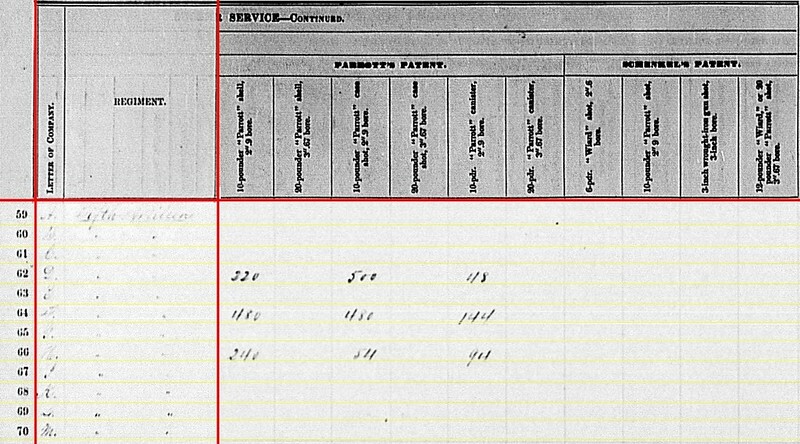 Battery A: At Pottsville, Pennsylvania, on the March 1864 receipt date, with four 12-pdr Napoleons. Battery A, under Captain Thomas H. Bates, reformed at Camp Barry, in Washington, D.C., after losing all its guns during the Peninsula Campaign of 1862. On June 4, 1863, the battery transferred to the Department of the Susquehanna and was assigned duty around Philadelphia. Battery B: At Warrenton Junction, Virginia, reflecting the October 1863 receipt date, with four 10-pdr Parrotts. The battery was assigned to Second Corps, Army of the Potomac. Captain Rufus D. Pettit, in command of the battery at the start of the quarter resigned at the end of May. Captain James M. Rorty then took command. Rorty was mortally wounded on the afternoon of July 3 at Gettysburg. The next in command, Lieutenant Albert S. Sheldon, was wounded a little later. Lieutenant Robert E. Rogers then became the third officer to command the battery that day. Battery C: Listed at Rappahannock, Virginia, also reflecting the fall reporting date, four 3-inch Ordnance Rifles. This battery was assigned to support Fifth Corps, and thus on the march toward Gettysburg at the end of the reporting period. Captain Almont Barnes remained in command. Battery D: Bealton, Virgina! Again, under the fall reporting date. This battery had six 12-pdr Napoleons. This battery supported Third Corps as part of the Gettysburg Campaign. Lieutenant George B. Winslow remained in command. Battery E: No return. Reduced by sickness and other causes during the Peninsula Campaign. At the start of the quarter, the men of Battery E was assigned to 1st New York Independent Light Artillery, in Sixth Corps. In mid-June, the men transferred to support Battery L, 1st New York (below). Battery F: Yorktown, Virginia with four 3-inch Ordnance Rifles. Captain William R. Wilson’s battery remained part of Fourth Corps, Department of Virginia. Later in July, the battery moved to Camp Barry in Washington. Battery G: Accurately reported at Taneytown, Maryland, with six 12-pdr Napoleons. The battery moved from Second Corps to the 4th Volunteer Brigade, Artillery Reserve in June. Captain Nelson Ames remained in command. Battery H: Reporting at Camp Barry with four 3-inch Ordnance Rifles, in October 1863. However, as the end of June, the battery, under Captain Charles E. Mink, was assigned to Fourth Corps and stationed at Yorktown. The battery was involved with Dix’s Peninsula Campaign. Battery I: No report. Captain Michael Wiedrich commanded this battery, assigned to Eleventh Corps. The battery had six 3-inch Ordnance Rifles at Gettysburg. And its employment on the field on July 1 might explain the lack of report. 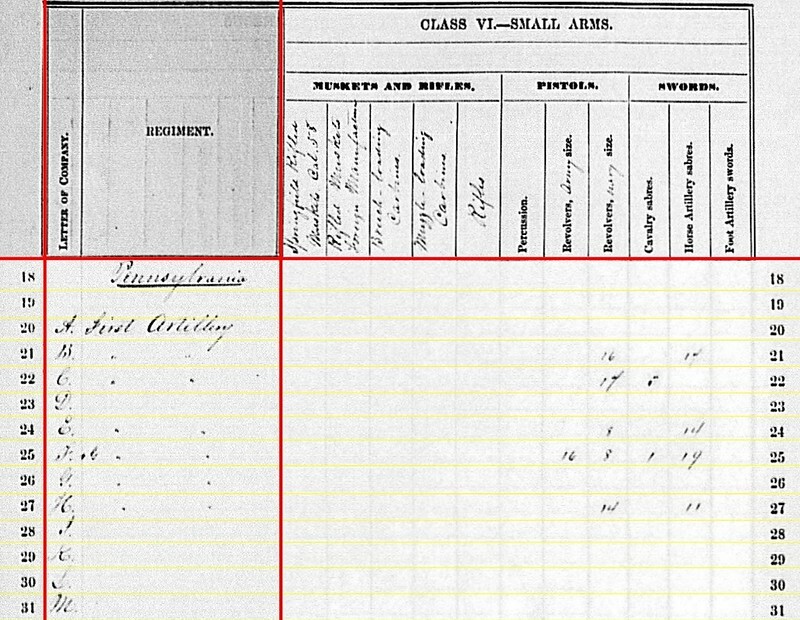 Battery K: Reporting at Brandy Station, Virginia with six 3-inch Ordnance Rifles. For the third straight quarter, this battery’s location reflects a January, 1864, report. 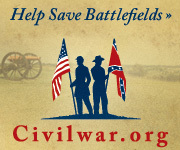 In June 1863, Battery K was assigned to the 4th Volunteer Brigade, Artillery Reserve, under Captain Robert H. Fitzhugh. The 11th New York Independent Battery was attached to Battery K at this time, adding two guns (up from four the previous quarter). 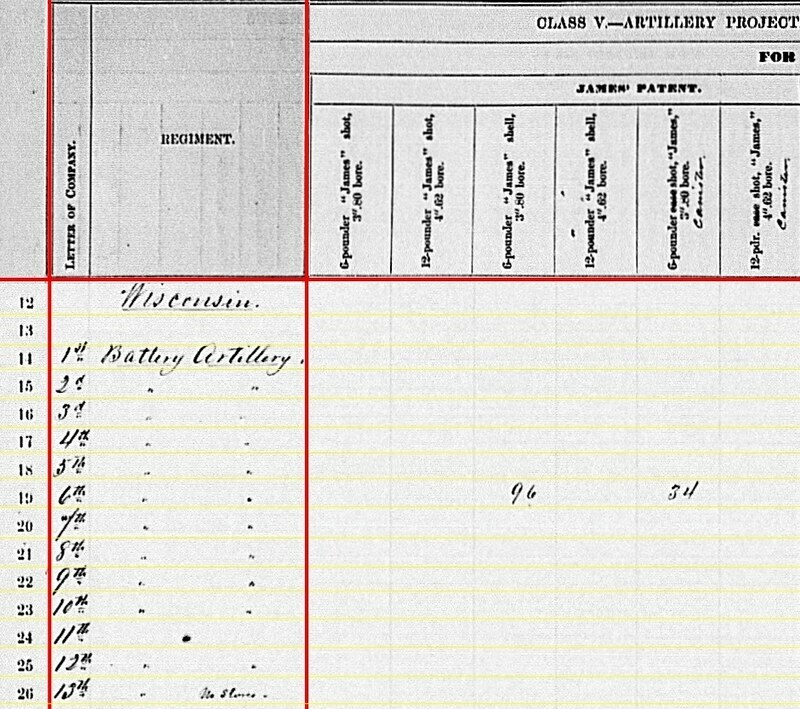 Battery L: Another “late” return, posted in February 1864, has this battery at Rappahannock Station, Virginia with six 3-inch Ordnance Rifles. This battery was on the field at Gettysburg supporting First Corps, on the first day of July. Captain Gilbert H. Reynolds took command in March. Battery M: No return. Battery M, under Lieutenant Charles Winegar, served in Twelfth Corps. The battery had four 10-pdr Parrott rifles at Gettysburg, with one section on Power’s Hill and another on McAllister’s Farm. Thus nine of the twelve batteries were directly involved with the Gettysburg Campaign. We might say the other three were indirectly involved to some degree. Many stories I could relate and wealth of quotes related to those hot summer days of 1863. But for brevity, let us focus on the data of the summary. Battery A: 192 shot, 64 shell, 192 case, and 72 canister for 12-pdr Napoleons. Battery D: 288 shot, 96 shell, 288 case, and 96 canister for 12-pdr Napoleons. Battery G: 308 shot for 6-pdr field guns; 120 shell, 116 case, and 144 canister for 12-pdr Napoleons. I would guess the tally of 6-pdr shot for Battery G was a transcription error, and rightly should be 12-pdr. Battery C: 92 canister, 40 percussion shell, 136 fuse shell, and 424 bullet shell for 3-inch rifles. Battery F: 80 canister, 80 percussion shell, 160 fuse shell, and 480 bullet shell for 3-inch rifles. Battery H: 21 canister and 34 fuse shell for 3-inch rifles. Battery K: 120 canister, 363 fuse shell, and 350 bullet shell for 3-inch rifles. Battery L: 120 canister, 39 percussion shell, and 600 (?) bullet shell for 3-inch rifles. Battery H: 128 shell, 530 shrapnel, and 160 canister for 3-inch rifles. Battery B: 320 shell, 520 case, and 96 canister for 10-pdr Parrott. Battery B: 80 shells for 10-pdr Parrott. Battery H: 3 shells for 3-inch rifles.. Battery K: 356 shells for 3-inch rifles. Battery L: 441 shells for 3-inch rifles. 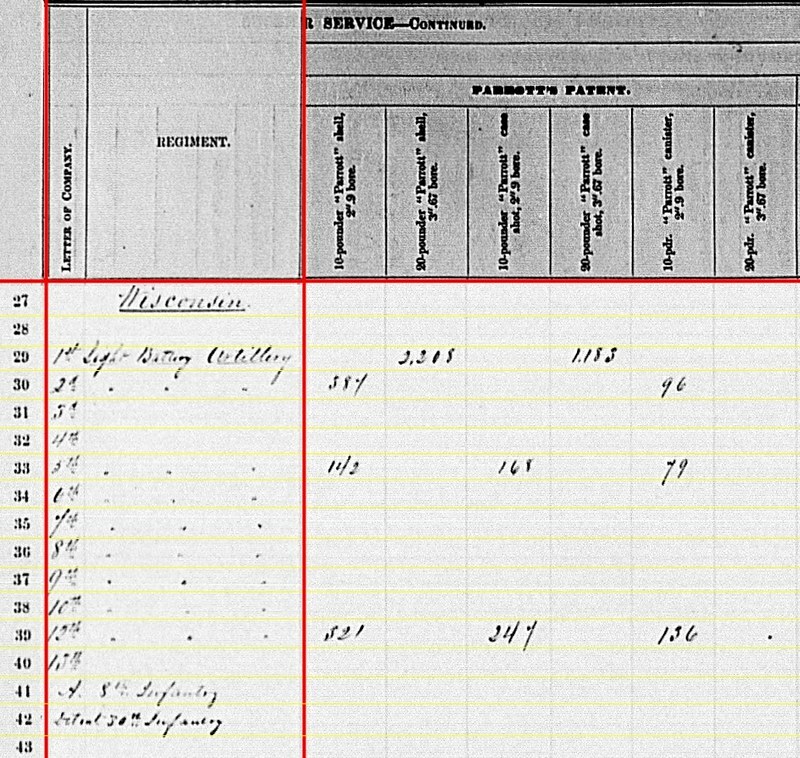 Again, we see a mix and match of projectiles, by patent, in the ammunition chests. Battery A: Seventeen Navy revolvers. Battery B: Twelve Navy revolvers and three cavalry sabers. Battery C: One Army revolver, eight Navy revolvers, and fourteen horse artillery sabers. Battery D: Eight Army revolvers and eight horse artillery sabers. Battery F: Thirteen Army revolvers and sixteen foot artillery swords. Battery G: Nineteen Army revolver and thirty-five horse artillery sabers. Battery H: Sixteen Navy revolvers and fifteen cavalry sabers. Battery K: Nine Navy revolvers and thirty cavalry sabers. Battery L: Seventeen Navy revolvers and ten horse artillery sabers. 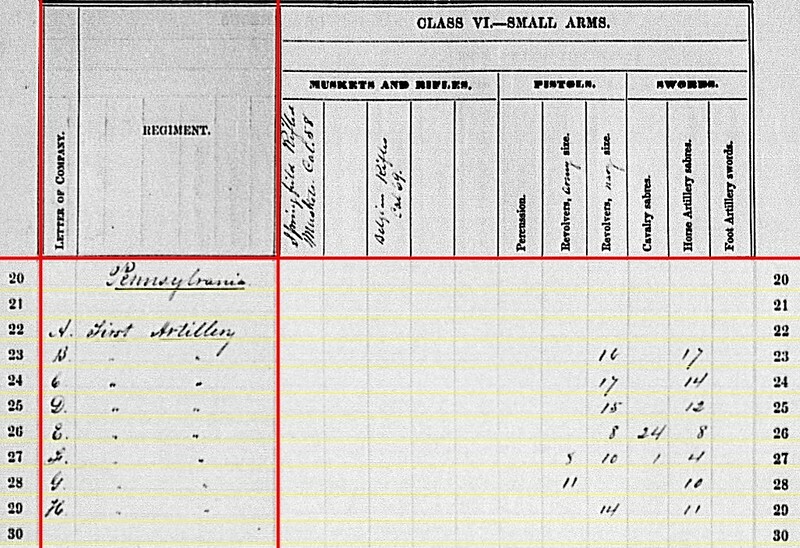 A very fair assortment, with reasonable numbers, of small arms for the 1st New York. These were field artillerymen, first and foremost. Battery A: At Portsmouth, Virginia with six 12-pdr Napoleons. During the spring, Battery A transferred, with parent organization, to Seventh Corps. Under the new arrangements, Lieutenant James Gilliss’ battery supported Second Division of that corps. The battery had been at Suffolk, Virginia, but was moving over to the Peninsula for Dix’s brief demonstration toward Richmond in late June. Battery B: Reporting at Hagerstown, Maryland with no artillery! Battery B was at Fort Hamilton through much of the spring, completing its training and such. In June, Lieutenant Henry A. Du Pont led the battery, reporting to First Division, Department of the Susquehanna, within the Middle Department’s Eighth Corps. And the battery reported there with six 3-inch Ordnance Rifles. Battery C: Technically off by one day, the battery reported at Gettysburg, Pennsylvania with six 12-pdr Napoleons. With Captain Dunbar R. Ransom taking command of the 1st Brigade of the Artillery Reserve (Army of the Potomac), Lieutenant Gulian V. Weir assumed command of this battery. Battery D: Bealton, Virginia (?) with six 10-pdr Parrotts. Lieutenant Charles Hazlett’s battery supported Fifth Corps. The battery’s location on June 30 of the year was, of course, in the vicinity of Union Mills, Maryland. And, as many readers are well familiar, Hazlett’s tenure in command was to end a couple days later as he defended Little Round Top. Lieutenant Benjamin Rittenhouse was his able replacement. Battery E: At Fort Hamilton, New York but without cannons. As with Battery B above, Battery E completed its training and organization during the spring. And like that sister battery, Battery E was transferred to the Department of the Susquehanna in June. Lieutenant James W. Piper was in command. The battery had six 12-pdr Napoleons. Battery F: No location given, but with six 10-pdr Parrotts. The proper location, we know, was with Sixth Corps, around Manchester, Maryland. Lieutenant Leonard Martin commanded this battery, which would defend Cemetery Hill on July 3. Battery G: Port Hudson, Louisiana with six 12-pdr Napoleons. Lieutenant Jacob B. Rawles commanded this battery from Second Division, Nineteenth Corps. Battery H: Tullahoma, Tennessee with two 12-pdr Napoleons and four 10-pdr Parrotts. This was “flip” from the previous quarter, which I believe is in error. The battery likely had four Napoleons and two Parrotts at this stage of the war. Captain George A. Kensel assumed command of the battery in mid-spring. And the battery remained with First Division, Fourteenth Corps. Battery I: Reporting at West Point, New York with four 3-inch Ordnance Rifles. 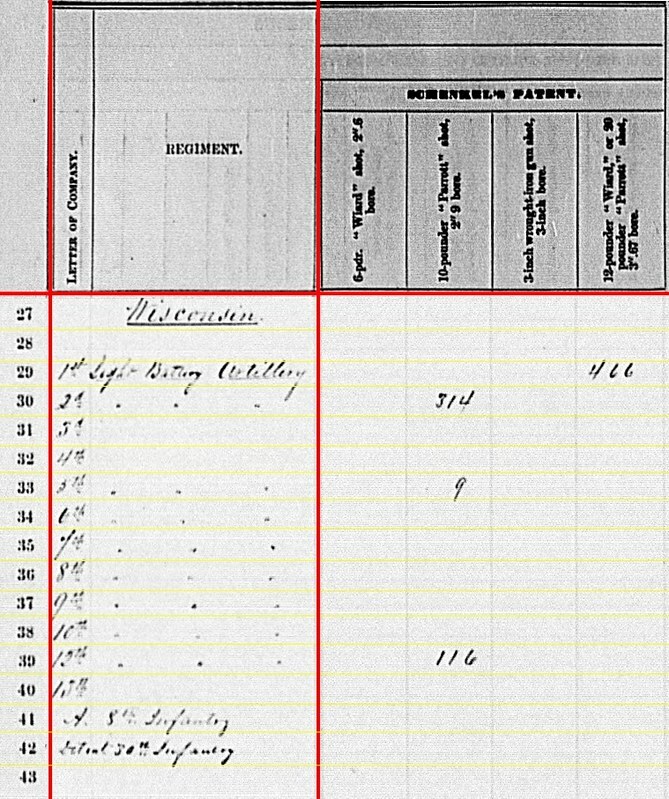 But we know that location is in error, possibly reflecting the 1865 report receipt date. On June 30, Lieutenant Malbone F. Watson’s battery was with Fifth Corps along Pipe Creek. Watson would lose a leg while leading his battery at Gettysburg on July 2. Lieutenant Charles C. MacConnell took his place. Battery K: No location given, but with four 12-pdr Napoleons. Another battery which we know was on the road to Gettysburg. Lieutenant David H. Kinzie remained in command, but the battery transferred to the Twelfth Corps’ artillery. Battery L: Reporting at Maryland Heights, Maryland with two 6-pdr field guns. Lieutenant Edmund D. Spooner’s battery was caught up in the disaster at Winchester, Virginia. According to Spooner, eighteen men, armed only with sabers, escaped capture (having lost six Ordnance Rifles). What remained of the battery reported to Camp Barry, which I’d submit is a more accurate location. The report of two 6-pdrs points to some interesting inferences. Battery M: At Warrenton, Virginia with six 12-pdr Napoleons. This location might be accurate for August, when the report was received. But at the end of June 1863 the battery was around Yorktown and was involved with Dix’s demonstration there. Captain James McKnight’s battery was assigned to Fourth Corps. So we see the batteries of the Fifth Regiment were actively engaged across the board. No easy garrison duty for those gunners! Battery A: 192 shot, 96 shell, 288 case, and 192 canister for Napoleons. Battery C: 465 shot, 162(?) shell, 369 case, and 100 canister for Napoleons. Battery G: 217 shot, 352 shell, 438 case, and 132 canister for Napoleons. Battery H: 172 shot, 64 shell, 171 case, and 100 canister for Napoleons. Battery K: 36 shot, 5 shell, and 3 case for Napoleons. Battery M: 288 shot, 96 shell, 288 case, and 96 canister for Napoleons. 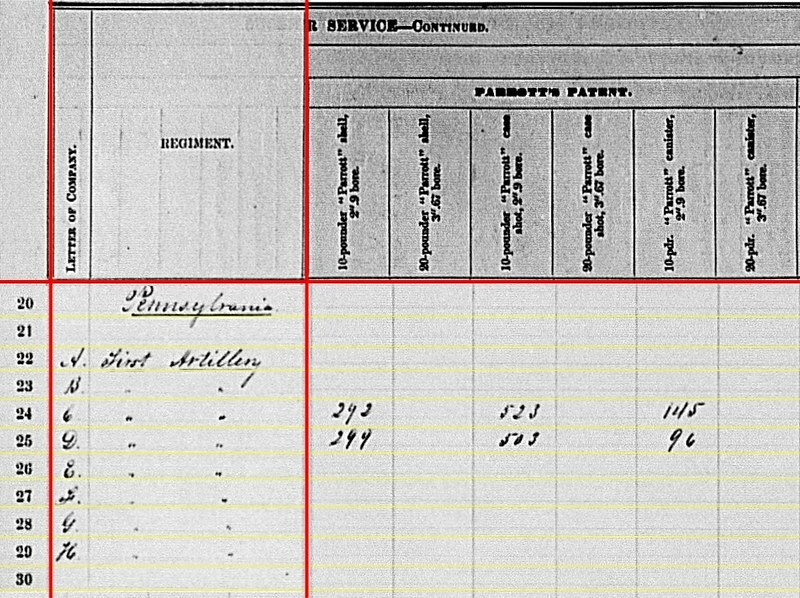 The line that stands out is for Battery K. Might those be the quantities on hand at the close of July 3, 1863? 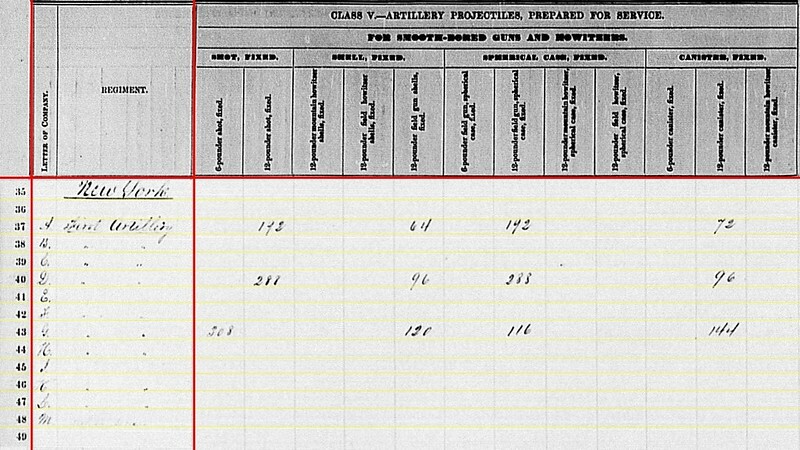 Battery E probably had ammunition for its Napoleons on hand, but not reflecting on this report. Battery I: 100 canister and 400 bullet shell for 3-inch rifles. Battery D: 320 shell, 500 case, and 48 canister for 10-pdr Parrotts. Battery F: 480 shell, 480 case, and 144 canister for 10-pdr Parrotts. Battery H: 240 shell, 54 case, and 94 canister for 10-pdr Parrotts. Battery D: 360 shell for 10-pdr Parrott. Battery F: 120 shell for 10-pdr Parrott. Battery I: 300 shell for 3-inch rifles. Overall, the two “pure” Parrott batteries seemed well provisioned. Battery H, which was mixed, might be a little lean. And Battery I, with its 3-inch rifles, seemed a bit short. But that might, again, be due to what the battery did during those first days of July. 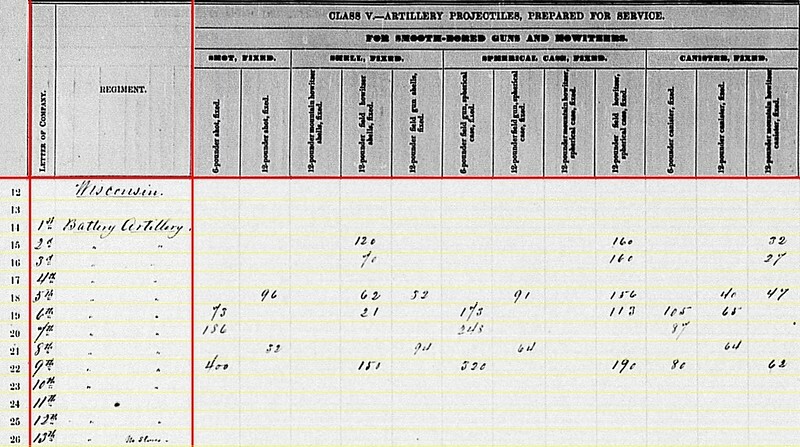 Battery A: Twenty-two Army revolvers and sixty-five horse artillery sabers. Battery B: A hundred Army revolvers and 138 horse artillery sabers. Battery C: Fifty-five Army revolvers and nineteen horse artillery sabers. Battery D: Thirteen Navy revolvers, fifteen cavalry sabers, and thirty-seven horse artillery sabers. 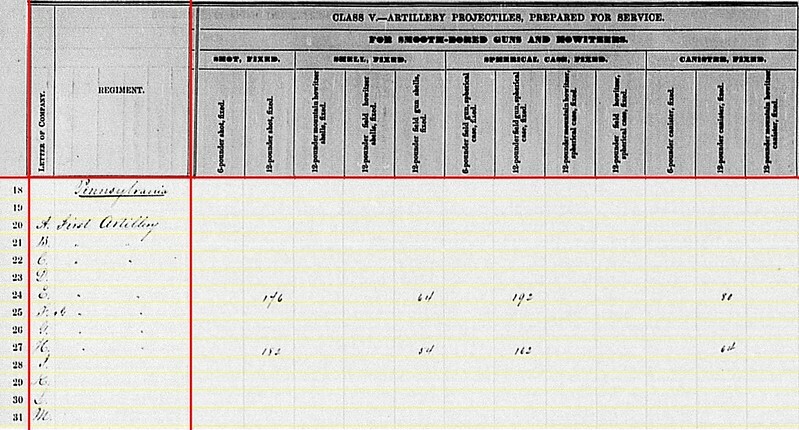 Battery F: Twenty-four Army revolvers and twenty horse artillery sabers. Battery G: Twenty-one horse artillery sabers. Battery H: Sixteen Navy revolvers, five cavalry sabers, and thirty-nine horse artillery sabers. Battery I: Twenty-one Army revolvers and thirty-five horse artillery sabers. Battery K: Fifty-eight Army revolvers and sixteen horse artillery sabers. Battery L: Nothing… not even the sabers reported carried off the field at Winchester. We again must keep in mind the time frame and context. 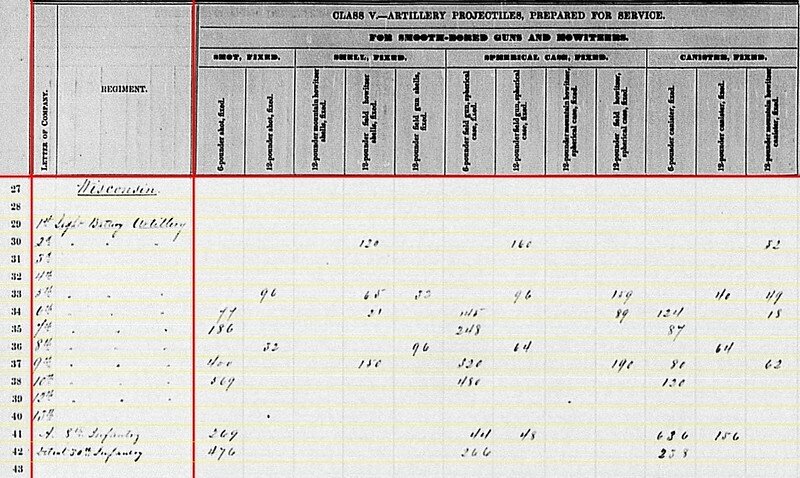 These numbers on the sheet were cannon, ammunition, and small arms which would be put to use by these batteries in June and July 1863.